LONG BEACH, California, Apr. 15, 2016 – The No. 66 Ford GT will start p7 in Saturday’s BUBBA Burgers SportsCar Grand Prix, while its sister No. 67 hopes to make the green flag after suffering a fire in Friday’s first practice session. Joey Hand qualified the No. 66 in the fourth row with a 1:18.120 quick lap. The 100-minute sprint race starts at 7:05 p.m. ET Saturday and will be broadcast on FOX Sports 2 and through the FOX Sports Go app. 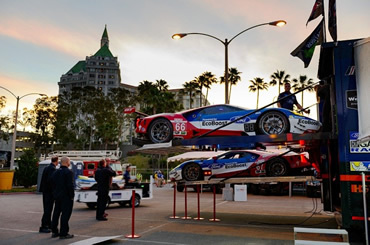 “I love Long Beach,” said Hand, who finished second at the venue last year in the Ford EcoBoost prototype. “It’s my favorite race venue. It’s a place where I’m always going for the pole. I’m always going for the win. We were going for it today, we just struggled a little bit trying to find grip here. We had a lot of understeer. I did my best. I tried to get everything out of it. Trouble came early for the No. 67 team after a leaking fuel fitting caused a fire in the No. 67 with Richard Westbrook behind the wheel. Westbrook was uninjured. Although some work remains left to be done to the felled car before it’ll be ready to race, the team expects it to make the green flag.